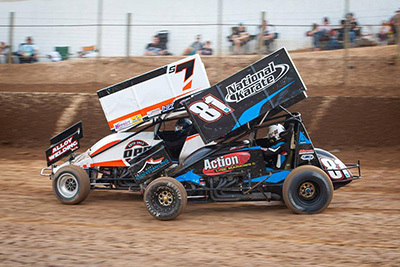 The Grand Final of the USC SA contest is scheduled at its home base Murray Machining & Sheds Speedway Murray Bridge, bringing down the curtain on another nail-biting season of Sprintcar action. Farr, who crisscrosses New South Wales, Queensland and South Australia each season with his ECP Racing Team has been in stellar form and has rarely been outside the top three in major events at ‘the Bridge’. His two most recent performances in SA saw him net an historic win in the inaugural “60 for 60 for 60” $15,000 to win affair on March 9/10. He then finished second in the USC “Ultimate Speedway Challenge” round on March 16 and competed with distinction in two other classes – the Speedcars and Late Models where he finished runner-up in the Speedcar in a bid to win an historic $100,000 bounty. Matt Egel was able to pull in some valuable points by winning the March 16 main event slightly atoning for the disappointment of rolling over the previous weekend in the 60 for 60 for 60. Farr’s consistency in finishing second to Egel on March 16 however kept him with room up his sleeve to maintain his advantage in the USC SA points battle. Speaking of consistency, Luke Dillon maintains the rage in third place in the series due to exactly that. It’s not been by any means the explosive second generation racer’s best season in terms of outright wins but he’s been consistent enough to keep the Championship overall in sight. Ryan Jones has never lacked speed and even recorded a win on ‘home turf’ a fortnight ago in the Ross Wright Memorial All Stars 360ci main event at Murray Machining & Sheds Speedway. He sits joint fourth with another ‘local’ in Strathalbyn’s Daniel Pestka as the pair arm-wrestle for a possible third, second or even slight chance of the series win with 150 points still up for grabs. Pestka has been under the radar in the family owned #27 J&J and though he has yet to land a 2018/2019 USC SA win he’s always in the ballpark of possibility. Steven Caruso would love nothing more than to bust into a top three situation with a podium or better this Saturday night and after his brother Mark’s success in the final round of the All Stars at Mildura last weekend perhaps there’s a chance for another Caruso success this time too. Caruso has yet to snare a USC main event success – maybe Saturday night he can change that. Lisa Walker’s 866 points may not be enough for her to claim the USC SA Championship but her speed and her tenacity have seen her develop into a legitimate contender for any A-Main she enters. Brad Keller’s current eighth place in the USC SA points belies his outright speed and ability to win races without notice. Hayden Pitt sits ninth in the points and in recent outings the second-generation hard charger has truly shown speed and potential in the OPR #7. Rounding out the top ten is Loxton Ford powered speedster Keke Falland who has once again ridden the rollercoaster that is Sprintcar racing this season. The Shadetec Ultimate Sprintcar Championship SA Grand Final kicks off this Saturday night (April 6) from 5pm. Murray Machining & Sheds Speedway Murray Bridge is located on Kennett Rd Murray Bridge.